Welcoming subscribers with open arms! Start your relationships with your subscribers on a positive note with welcome emails. 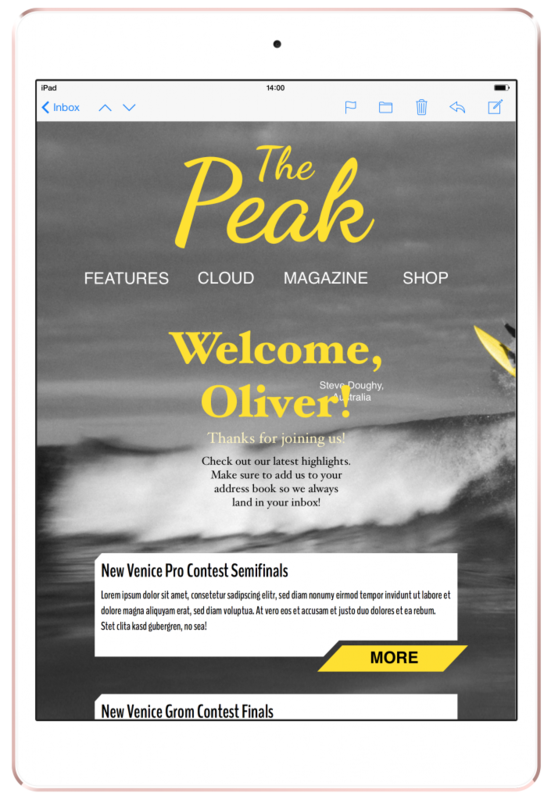 Welcome emails can set a tone for how you communicate with your subscribers. 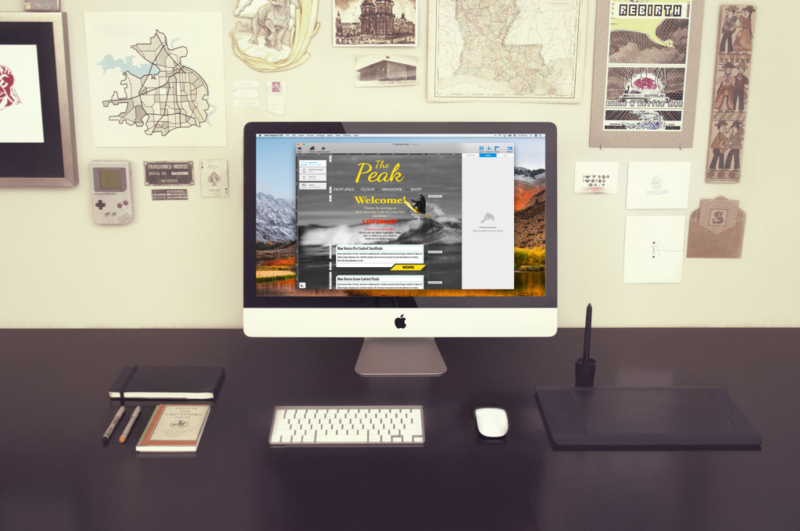 In fact, it’s a great way for your subscribers to get familiar with your communication and design style. Think branding. Your tone, your logo, your colors – they all matter from the very beginning. Within an email campaign series, welcome emails tend to have a higher opening rate than regular sales emails. So be creative with your welcome emails! Stay away from writing just one sentence or two in your welcome emails. This is a great opportunity to make a great impression so make it count! Truth be told… Most subscribers actually expect a welcome email. Welcome emails have become a standard businesses practice. Businesses are expected to send some type of welcome email after a person has opted in for their mailing list. It reassures the people that everything went fine and that they are officially subscribed. Send welcome emails promptly. Time is of the essence. Send the welcome email on the same day when the person opted in. And whenever possible, send the welcome email instantaneously – just right after the person has confirmed his or her subscription. Waiting will negatively affect the opening rate of your welcome email. The longer you wait, the less likely the person will open the email. Remember to get personal! Try to include the person’s name in the subject line or within the email. Greeting the person by his or her name makes your brand seem more approachable and adds to the welcoming vibe of the email. It is also easy to do – just include a name placeholder and you are good to go! Make sure to follow the rules of your email service provider (ESP). Some will ask you to write [#NAME]. Others will ask you to write [#FULLNAME]. And there will be other ESPs that will ask you use something different. Double-check how it works with your ESP to ensure that the placeholder works like it is supposed to. When it comes to the subject line, it doesn’t hurt to get to the point with just a few characters. You don’t want to drag out your subject line because you run the risk of losing your audience’s attention. Even a simple “Welcome to [INSERT BRAND NAME]” works! Whether you choose the conservative or the creative route, you must always write an interesting, attention-grabbing inbox snippet that readers cannot ignore. The inbox snippet is the place where you can get creative and informative. Inbox snippet allows you to expand from your email title without telling the complete story. Think of it as the more concise version of an abstract. 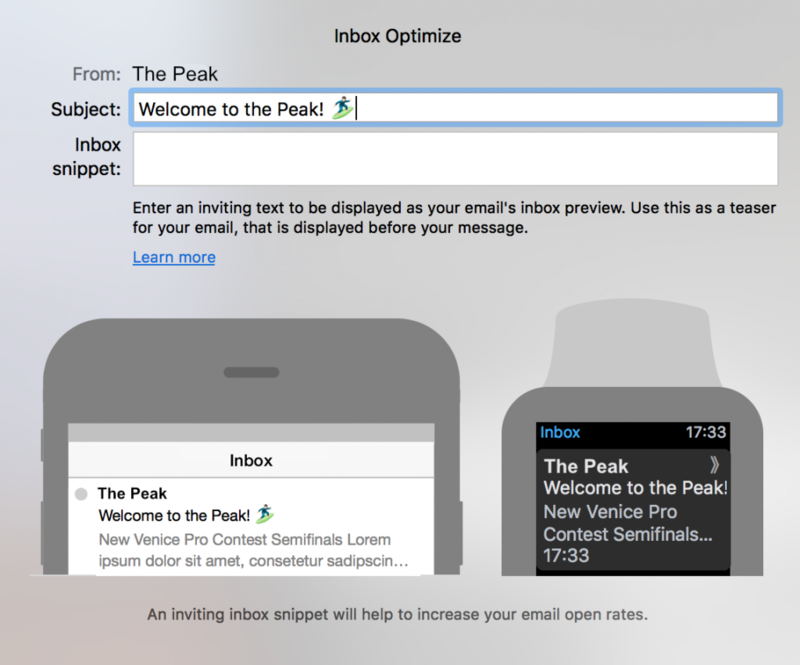 Mail Designer 365 makes it really easy to optimize the inbox snippet of your welcome emails. 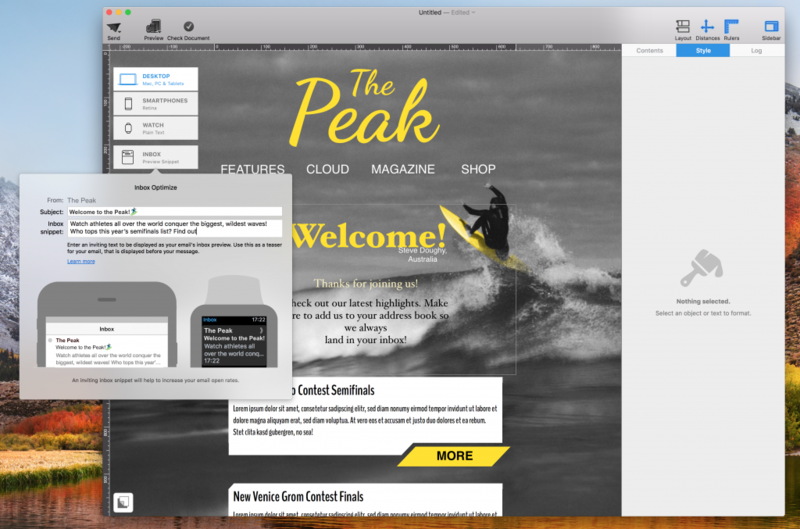 Just click “INBOX” on the left side of your Mail Designer 365 window. If you are using segmentation, you can use the welcome email as a sorting tool. You can ask your subscriber exactly what type of mailing list he or she wants to be a part of, based on the subscriber categories your business has created. For example, you can ask your subscribers how often they want to receive emails from you. This is a great option if you happen to segment your mailing list based on email frequency. Another way is to ask them what categories they are interested in. For instance, if you are a sports brand, you can ask your subscribers if they are interested in basketball, football, soccer, tennis, volleyball, surfing, etc. This will give you the opportunity to send email campaigns that your subscribers are actually interested in. 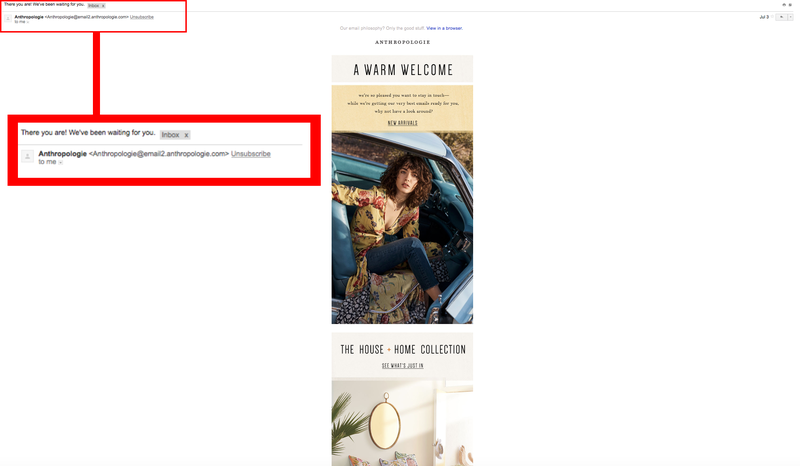 Because welcome emails have relatively high opening rates, you can really reap the benefits by giving your subscribers a little incentive to shop. A discount code may be the extra nudge that your new subscriber needs to visit your online store and make a purchase. Sometimes a little incentive goes a long way. Make sure to also build a little sense of urgency. Decide when the code will expire to help motivate your subscriber to browse around and shop as soon as possible.